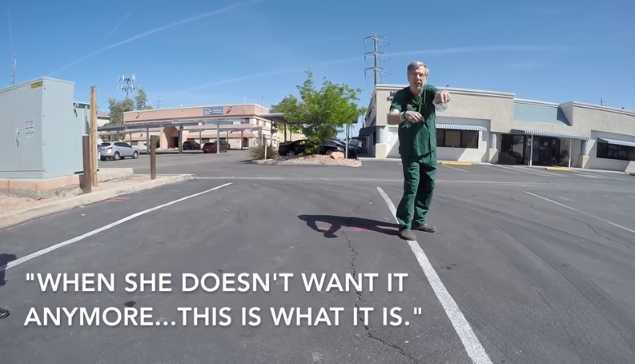 LAS VEGAS, Nev. — A video recorded outside of a Las Vegas abortion facility captures a Jewish abortionist confronting a group of Christians with a container holding the remains of an early gestated child in an attempt to assert that he was not killing babies. Approximately 10 sidewalk counselors stood outside of A-Z Women’s Center on Saturday to urge parents not to kill their child. As Nick and Kelsey Hendrix were speaking to a couple who had arrived at the facility, abortionist William Ramos approached. “You’re going to be accountable for all the murders you commit every day,” Dave Shumaker called out. “Weren’t you an embryo once?” Shumaker asked. Shumaker asked Hendrix if he has read Psalm 139, which states that God knits the unborn together in their mother’s womb. “[Then] why in the Torah is there a greater punishment when the woman is pregnant and the baby is hurt if it’s not even a life?” Shumaker asked. “That I have to see,” Ramos replied, thinking for a moment. However, moments later, Ramos returned to the parking lot carrying a solution-filled container in which floated the remains of an early gestated child in an effort to prove that he is not taking life. “That’s not a baby. You see a baby in there?” he asked. Shumaker returned to his previous point, reading Exodus 21:22-25 aloud to Ramos. “When men strive together and hit a pregnant woman, so that her children come out, but there is no harm, the one who hit her shall surely be fined, as the woman’s husband shall impose on him, and he shall pay as the judges determine. But if there is harm, then you shall pay life for life, eye for eye, tooth for tooth, hand for hand, foot for foot, burn for burn, wound for wound, stripe for stripe,” the Scripture reads. Ramos then asserted that there is a difference between wanted and unwanted babies. Hendrix told the Liberator that he believes Ramos brought the container to the parking lot in an effort to ease his guilt. He said that the experience left those present in grief.